The candidate genes most strongly implicated in NDD causation encode for proteins involved in synaptic architecture, neurotransmitter synthesis (e.g., γ-aminobutyric acid serotonin), oxytocin receptors, and cation trafficking (Sakurai et al. 2011). No single anomaly predominates. Instead, autism appears to be a family of diseases with common phenotypes linked to a series of genetic anomalies, each of which is responsible for no more than 2–3% of cases. The total fraction of ASD attributable to genetic inheritance may be about 30–40%. "research in environmental causation of NDDs on a short list of chemicals where concentrated study has high potential to generate actionable findings in the near future. Its ultimate purpose is to catalyze new evidence-based programs for prevention of disease in America’s children." The authors recognize that the list of 10 possible environmental causes deserving of focused research at this time would expand with time and scientific developments. As a start though they propose based on the studies referenced following the substance: Lead (Jusko et al. 2008) Methylmercury (Oken et al. 2008) Polychlorinated biphenyls (Winneke 2011) Organophosphate pesticides (Eskenazi et al. 2007; London et al. 2012) Organochlorine pesticides (Eskenazi et al. 2008) Endocrine disruptors (Braun et al. 2011; Miodovnik et al. 2011) Automotive exhaust (Volk et al. 2011) Polycyclic aromatic hydrocarbons (Perera et al. 2009) Brominated flame retardants (Herbstman et al. 2010) Perfluorinated compounds (Stein and Savitz 2011). 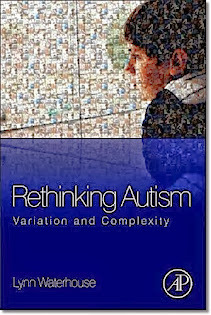 The strategic approach to environmental autism research is an idea who time has come. In fact it is long overdue. The respected authors of the EHP editorial will undoubtedly be vilified by the usual suspects, Neurodiversity ideologues and industrial and pharmaceutical spin doctors employed to cast doubt on the need for any environmentally focused autism research. However, given the support of the NIEHS and Autism Speaks, there is substantial reason to hope that the strategic focused study of environmental causes of autism and other neurodevelopmental disorders is underway. 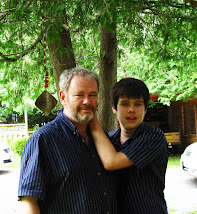 Adults with Severe Autism Disorders: Do Canadians Give a Damn? 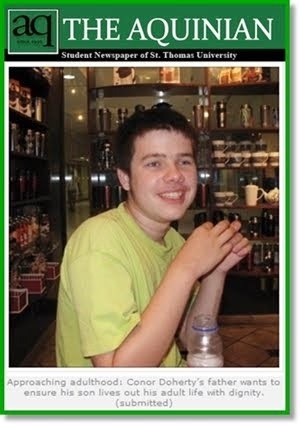 "Taylor McNee is an 18-year-old with autism who been living in a hospital room for five months because there is nowhere else for him to go. And his case is once again highlighting a growing problem: who will take care of autistic children once they become adults? Taylor has a genetic condition called Fragile X syndrome, which has led to both autism and developmental delays. 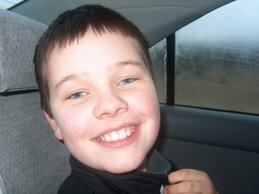 His family says he is a sweet, loving boy who is usually very easygoing. But Taylor is prone to rages and can suddenly lose control. 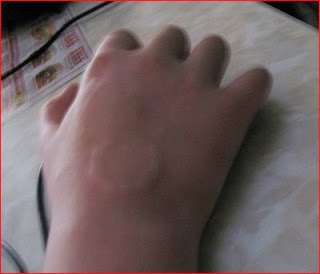 Five months ago, one of the rage incidents led to injuries that required him to be taken to Toronto Western Hospital. He's long since recovered but has been there ever since. The hospital says Taylor needs to leave, since he no longer needs medical care. But his mother says it's not safe for him to come home and that he risks injuring his younger brother, Ethan, who also has a genetic developmental disorder." 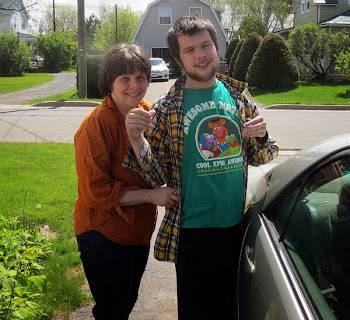 The Taylor McNee story is common elsewhere in Canada including here in New Brunswick where severely autistic adults live in inadequate group homes lacking the professional expertise and adequately trained staff, life in a psychiatric hospital and a variety of ad hoc arrangements. Efforts to establish an intermediate level facility close to autism expertise in Fredericton have been spurned both by government and by the New Brunswick Association for Community Living which dominates all decision making involving persons with disabilities in New Brunswick. As in education so too in adult autism residential care. 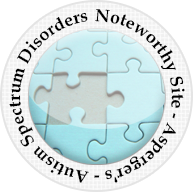 The NBACL offers feel good cliches about community and inclusion but resists efforts to establish an intermediate level of care with the expertise and accommodation of the challenges of the severely autistic developmentally delayed population. The NBACL officials, Order of Canada and Order of New Brunswick ribbon collectors and political friends feel good. The severely challenged autistic population and their families are left to fact the reality of live in hospitals ... if they are lucky. 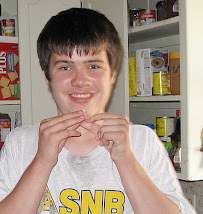 Here in New Brunswick, and elsewhere in Canada, we must abandon reliance on feel good cliches and fluffy philosophies and start focusing on the realities of life for severely autistic developmentally delayed adults with the aim of providing them with appropriate facilities in which to live out their lives in decent conditions. LDAC Executive Committee in February 2005, the LDAC Board of Directors in June 2005 and ratified on November 26, 2005). educational inclusion or any policies that mandate the same placement, instruction, or treatment of all students with learning disabilities or the idea that all students with learning disabilities must be served only in regular education classrooms at the exclusion of all other special education placement options. LDAC believes that full inclusion, when defined this way, violates the rights of parents and students with disabilities guaranteed by the Charter of Rights and Freedom and Human Rights Codes which guarantee education equality and freedom from discrimination and rejects the arbitrary placement of all students in any one setting. Inclusion is good when it means something more than placement in a common mainstream classroom. Inclusion is good when it does not deprive individual students with a range of education placement options that suitable for their needs. Inclusion is good when it is evidence based on the best interests of the individual student. Flexible inclusion is good. Inflexible, dogmatic, everyone in the classroom philosophy is not good. It harms some students and deprives them of a meaningful, happy education experience. Autism advocates in New Brunswick fought the extreme everyone in the mainstream classroom model during the MacKay and Ministerial Committee inclusion reviews. We were successful in ensuring the enactment of an inclusive education definition by our Department of Education which recognizes that real inclusion means an approach which assesses the individual needs, abilities and challenges of individual students on an evidence basis. Now Gordon Porter and the NBACL, both of which oppose the evidence based approach, are now in charge. They are effectively writing and enforcing their extreme mainstream classroom inclusive education for all policy for the Alward government. Autism parents must be vigilant in resisting their back to the future philosophy and insist on an evidence based approach guided by our children's best interest; as radical as those concepts may seem to Mr Porter and company. It is not clear where the Learning Disabilities Association of New Brunswick stands on these issues but their counterparts in the LDA of Canada and Ontario have spoken clearly and their positions are consistent with an evidence based student centered approach. Their clear, strong positions will be of great help in our efforts. The New Brunswick Association of Community Living now determines inclusion and disabilities policies in the New Brunswick government with immediate repercussions in the Department of Education and Early Childhood Development ... to the detriment of many children with autism disorders. While always very influential in NB government education decisions the NBACL is now effectively in charge of disability and inclusion policies in New Brunswick schools. The ramifications for children and students severely affected by autism disorders and intellectual disabilities are very serious. Independent, quality, autism specific training has been abandoned in favor of in house training and more and more pressure will be brought to bear on district and school officials to require all children receive instruction in a mainstream classroom even those for whom the mainstream classroom causes physical harm and disrupts their learning and development. In the decade preceding the election of the Alward government New Brunswick made many gains in providing providing evidence based autism interventions to New Brunswick preschoolers and students over the decade preceding the Alward government election. 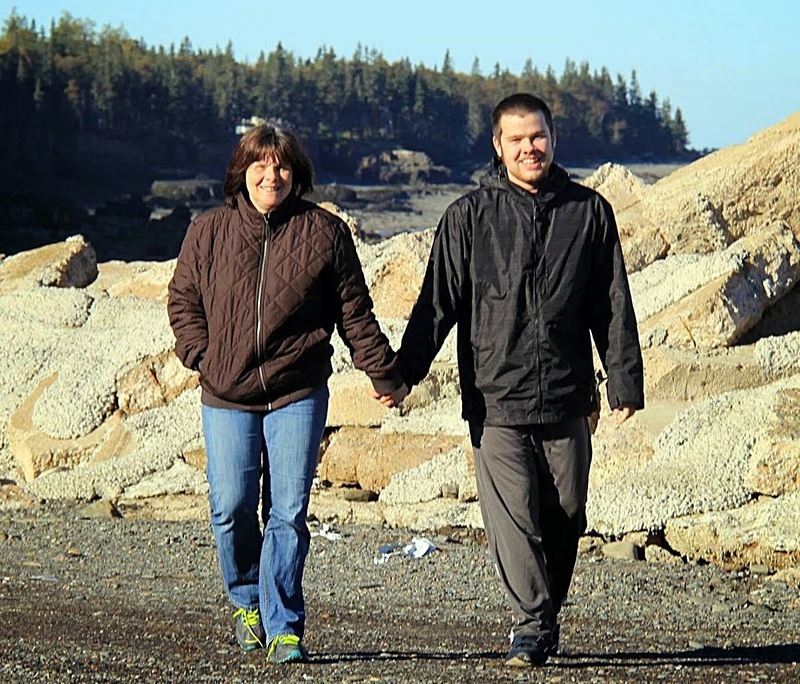 Those gains were provided via UNB-CEL Autism Intervention Training, a program recognized by US autism experts David Celiberti and Eric Larsson as a model for other Canadian and some US jurisdictions. 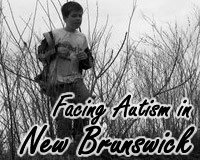 Those of us who advocated for these autism specific services were opposed strenuously by the very well connected and influential New Brunswick Association for Community Living. Now, under the Alward government the NBACL is even more influential. NBACL actually sets Alward government disability policy and ensures compliance by Education officials from the Deputy Minister level down to the teachers and aides that deliver the programs. Along the way the UNB-CEL Autism training has been dropped in favor of in house "training" and a renewed push for dumping all children in the mainstream classroom without regard for whether the classroom is the appropriate learning environment for them. There is no room for flexibility or accommodation of children and students with severe autism disorders with intellectual disabilities in the NBACL Department of Education and Early Childhood Development. "New Brunswick Premier David Alward issued a letter Friday February 4th to all participants in the ‘Policy Making for Inclusion – Leadership Development Program’ that will be delivered in Fredericton by IRIS February 6-10 to senior officials with the Government of New Brunswick. The program is designed to assist policy makers achieve the government’s platform commitment to “enable New Brunswickers with disabilities to actively participate in all aspects of society and take their rightful place as full citizens.” With Deputy Ministers, Assistant Deputy Ministers, Human Resources Directors and Policy/Program Directors from across government participating in the week-long series of leadership development workshops, major strides will be taken towards creating a public service in New Brunswick ready and able to deliver on the government commitment to people with disabilities. In his letter, Premier Alward thanked The Institute “for developing this program to inform our public servants on the latest research on disability and inclusion…” A core resource for the program is the guide to Disability and Inclusion Based Policy Analysis just published by The Institute." Even without the indoctrination of high ranking government officials in a week long session of Community Living policies the NBACL exercised a dominant role in the NB government. NBACL official Krista Carr is the wife of Early Education and Childhood Development Minister Jody Carr. Minister Carr's brother Jack Carr, also a member of the governing Alward Conservatives, is a former NBACL employee. Gordon Porter, an icon of the NBACL and CACL organizations, was a member of the Alward transition team and is now conducting yet another inclusion review with the aid of NBACL friendly team members. Only views consistent with the NBACL total inclusion beliefs are tolerated. In the past high school principals have been trained by NBACL officials who handed out awards annually to teachers who exemplify best (as in NBACL compliant) inclusion policies. Admittedly the cliches and buzz words sound good. Community Living Association spokespersons never tire of telling us how awful things were in the bad old days before they changed everything for the better. The NBACL, the CACL, IRIS and other CLA groups never, ever, acknowledge the evidence of the harm they have caused to some people by their fanatical obsessions like total classroom inclusion for all. 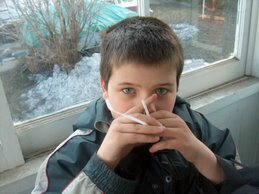 My son with severe autistic disorder and intellectual disability suffered in a mainstream classroom. Conscientious educators locally, who actually work with and know my son have accommodated him with a flexible inclusion model, a model which is now at risk in the NBACL Department of Education and Early Childhood Education era. The NBACL aristocracy that sets and enforces inclusion policy does not mention evidence like my son's case, that contradicts their everyone in the classroom philosophy. So too the total inclusion extremists pay no attention to severely impaired adults who can not live in an ad hoc, loosely monitored group home system make no mention of the adults with autism disorders and intellectual disabilities living in psychiatric facilities in NB. Instead they pretend all is swell, give each other awards, pat each other on the back incessantly and fight efforts to establish or even discuss an intermediate level of residential care with professionally trained assistants and higher levels of security for those who need such interventions. There is no evidence to support the policies of the NBACL which now sets inclusion policies for New Brunswick government departments including Education and Early Childhood development. The evidence based consideration of the best interests of individual students is in serious, serious threat of extinction in the NBACL dominated Alward government era. Specialized training such as that provided by the UNB-CEL Autism training program is now gone. 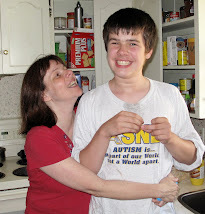 Flexible inclusion policies such as that which have accommodated my son with autism specific instruction will be targeted. The NBACL is in charge. 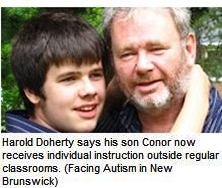 The caption below the picture of me and Conor is from the CBC web site article Autism advocate questions 'extreme' inclusion model. "A high-profile autism advocate in New Brunswick is questioning the merits of what he calls the Department of Education's extreme inclusion model. “I believe that the kind of evidence-based intervention that we need for our children, in some cases children with autism, is absolutely necessary and to deny it is a denial of the human rights, basically, of children like my son,” he said. Doherty was responding to a recent statement written by Gordon Porter, the former head of the New Brunswick Human Rights Commission. Harold Doherty, who has an autistic son and runs a blog dedicated to autism issues, contends the classroom isn't the right setting for every child. Porter, who has played a key role in the province's approach to inclusive education, wrote on a Canadian education website that some interventions in the school system result in segregation and pose a challenge to inclusive education. Doherty, however, argues that’s based on philosophy, not evidence. He is challenging Porter to a public debate on the issue." Following is the CBC audio clip of my interview by CBC's Terry Seguin. 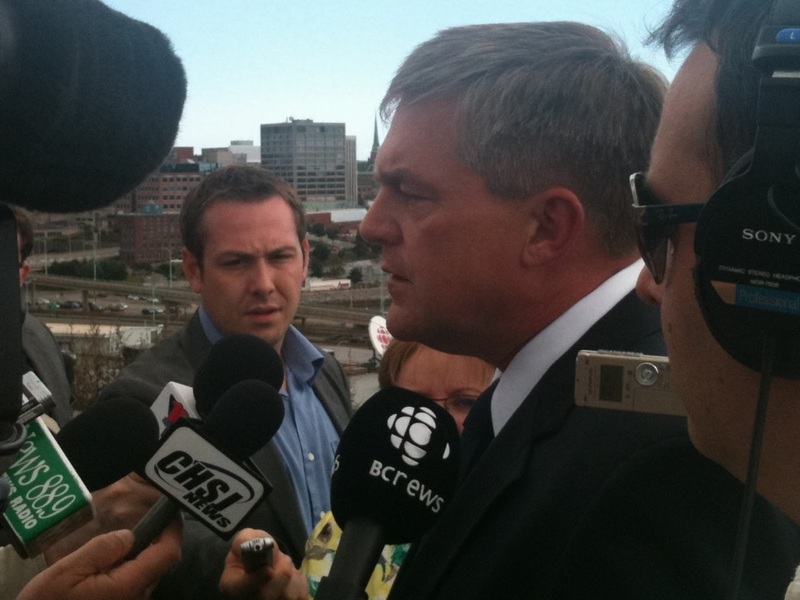 Dr. Gordon Porter was one of the members of NB Premier David Alward's post election transition team of special advisers. 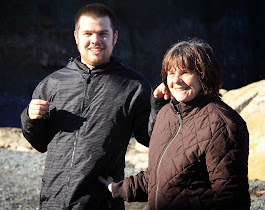 Unfortunately for many NB students with severe autism deficits he has continued to act as a special adviser to both Premier Alward and Education and Early Childhood Development Minister Jody Carr. 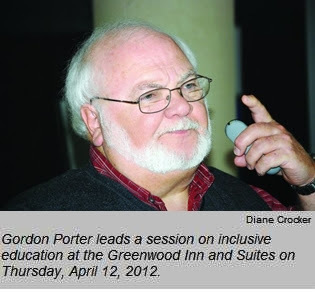 Gordon Porter's past record consists of promoting his own extreme inclusion agenda which dictates that all children with special needs, including children severely affected by autism disorders and developmental delays, must be educated in the mainstream classroom. A recent comment by professor and education consultant Dr. Paul W. Bennett questions Dr. Porter's "full" inclusion philosophy and highlights a recent public statement by Dr. Porter that does not bode well for some special needs children in NB schools, including those, like my son, who are severely affected by autism and developmental delays. Since the last provincial election Dr. Porter has been conducting yet another review, the third such review in the past 10 years, of inclusion policies in New Brunswick schools. The first was conducted by Wayne MacKay. During that process I attended as an autism representative with fellow autism parent Dawn Bowie, a registered nurse. Dr. Porter who participated in a discussion group with Dawn and me was visibly unhappy with our attempts to speak specifically about the needs of autistic children, the needs of some autistic students for evidence based learning methods and quieter learning environments outside the mainstream classroom. He admonished us for our comments declaring that "you people" should be thankful for what you have. An evolving and systemic model of inclusive education where all children reach their full learning potential and decisions are based on the individual needs of the student and founded on evidence. 3. all students have the right to learn in a positive learning environment;"
The evidence based practices principles established in the 2009 inclusive education policy was opposed strenuously, during the second inclusion review, by the representative of the New Brunswick Association for Community Living, a group tied very closely to Dr. Porter. The third inclusion review led by Dr. Porter is likely to see an unraveling of the principles of evidence based accommodation of individual student needs. I attended, after requesting the opportunity to do so, a discussion group held at the education building on King Street in Fredericton, during the third review directed by a retired education official with close ties to the NBACL. I arrived before other participants and had a pleasant chat with the director. Once the discussion started though the director did not want to let me contribute to the round table discussion. She stated twice, in denying me the opportunity to speak, that we would like to give others the opportunity to speak. I was puzzled because I had not addressed the discussion at all when she began muzzling me. Finally I asked her if she would prefer that I leave the discussion since she apparently did not want to hear what I had to say. She did then allow me to speak but it was clear to me that my input was not welcome. In his comment “Full Inclusion” in Public Schools: Is It Best for all Special Needs Kids? Dr. Paul W. Bennett reviews Dr. Porter's "full" inclusion model, some of the history of the perpetual campaign by Dr. Porter and Professor Wayne MacKay to impose their extreme version of inclusion on New Brunswick schools and their close connections to the current New Brunswick government. He summarizes a recent commentary by Dr. Porter on the subject of inclusion in our schools, and asks serious questions about Porter's apparent bias as the co-director of the current New Brunswick inclusion review. In the commentary Are We Star Gazing? Can Canadian Schools Really be Equitable and Inclusive? Dr. Porter displays no knowledge or understanding whatsoever of the needs of autistic children in the school system. The ego that landed 30 years ago and imposed extreme inclusion on all NB students including those, like my son, with severe autistic and developmental challenges, goes into a full scale attack against the provision of expert, evidence based approaches to the education of children with severe challenges: "we need to repudiate the notion that “special” or “expert” is better when the result is a program that is “segregation” and “exclusion”"
Gordon Porter provides no references to studies or evidence of any kind to back up the opinions he expresses in his commentary. My son was removed from one of Dr. Porter's "inclusive" classrooms here in New Brunswick at our request because he was biting his hands every day in the classroom where he was overwhelmed by the sensory challenges and by the fact that he was not functioning on the same level of intellect and understanding as his chronological peers. He was removed with the cooperation and concern of the local educators who could actually see what Gordon Porter's inclusion, what his egotistical insistence that all children prosper in the mainstream classroom was doing to my son. Gordon Porter's inclusion was hurting my son. Once removed from the classroom to a quieter area the biting ceased. Now in high school Conor starts his days with other challenged children in a resource center, he goes to public areas of the school and to the swimming pool at the local middle school he once attended. He also recently attended, with other challenged students from the school's resource center, a play put on at the Playhouse by a group of Leo Hayes High School students. My son has been accommodated under a flexible model of inclusion which sees him visit common areas and socialize within his abilities while receiving the evidence based instruction he needs in quieter areas of the school. With flexible inclusion and the evidence based instruction Gordon Porter opposes my son absolutely loves school. It is Gordon Porter's extreme inclusion model that has in the past, and once again, poses a serious threat to his real inclusion in a positive educational experience. You may or may not be a star gazer Gordon Porter but you are fundamentally ignorant about what my son, and many others with similar challenges, need in order to prosper and enjoy their education experience. 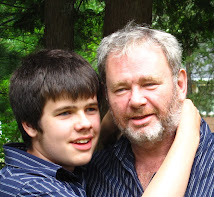 Dr. Porter, if you, or any of your friends in the NBACL or in the Alward government, are reading this blog I challenge you to debate me openly and publicly on the merits of the extreme inclusion model that caused harm to my son and which you are now in the process of imposing once again on him and children with similar challenges. I won't hold my breath waiting for you to accept my challenge. 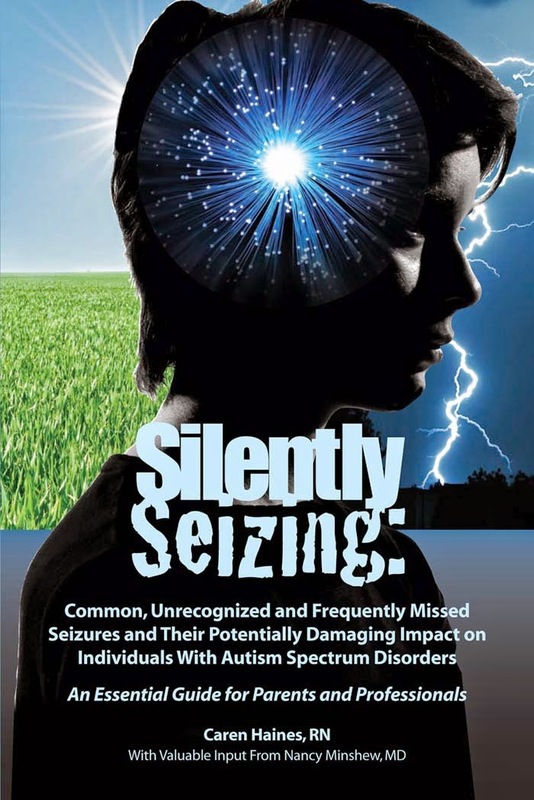 Autism Rates Reach New Epidemic Levels? 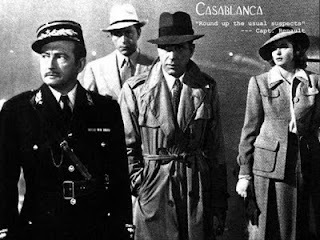 Round Up the Usual Suspects!